Okay, in my marathon post on focus, you heard me talk about how slow shutter speed can be one of the causes for “soft” or out-of-focus pictures, right? Well, one way to help with that is to use a tripod or monopod. Both tools will help steady the camera and prevent movement you would other wise have from your own hand shake. The most ideal tool for ensuring complete stillness is a tripod, however we don’t often have time to set up a tripod when in certain situations. And, tripods can be bulky and take up more space than you might have. So, a wonderful solution is the monopod. 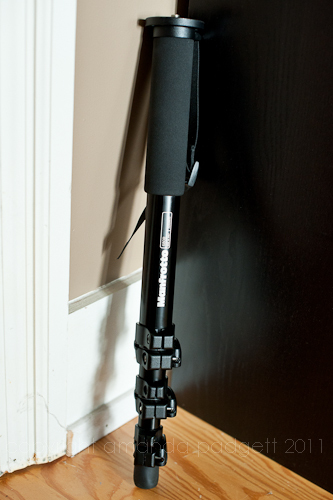 In September I purchased the Manfrotto 680B monopod and I have been very pleased! Not only does it help me hold steady so I can use a slower shutter speed when light is low, but it helps me not break my wrists holding up the D700 with the Tamron 70-200mm f2.8 lens (which is a monster). I have used the monopod at the wedding I did last month, plus at all my son’s football games (if I lugged the D700 with me). You can adjust the leg so easily to be longer or shorter, in just a couple of seconds, whereas with a tripod you have to adjust each of the legs, taking up more time. When I was finished shooting, I quickly close down each section and carry it on my wrist or under my arm. Here is a shot of my pink princess, posing not all that willingly, with the Manfrotto monopod fully extended, so you can get an idea of the size. If you are struggling with keeping your shutter speed fast enough to ensure good focus, think about investing in a good monopod. And, I encourage you not to buy the cheapest one you see. you are putting an expensive camera and lens on it, so you want one that is well built and durable. Please remember, this is NOT a tool you will use if you need a long shutter speed, like for night shots and such. Those type shots require a tripod. Monopods are great for weddings, nature and sports photography. Okay, on to the giveaway!!! I am giving away a Manfrotto 680B to one lucky person! Comment #3, Lori, was the winning number. Congrats, Lori!!! To enter the giveaway simply tell me if you use your right or left eye when looking through your viewfinder (in other words, which one do you keep OPEN when shooting). Note: Links are Amazon affiliate links, which mean I receive 3% of sales made from purchases, which I use to help me pay for the products I giveaway here. I use my right…however, I read some where that you should keep both open, so that you can be aware of your surroundings with the eye that isn’t on the viewfinder…easier said than done. I keep my left eye open! I use my left eye and try to keep both eyes open but that doesn’t always happen. I use my right eye. I use my right eye, but I can’t close my left eye and keep the right open! I never have been able too! haha I SO need this, I was asked to shoot at a concert at our local casino and I was thinking of buying one of these! This would be awesome! WHOOHOO! Thanks! I use my right eye. Thanks for the opportunity! Kind regards. I’m a lefty;) and I often end up with a headache over my right eye. I always use my right eye. Left is has a contact in it for distance so wouldn’t see to good if I used it lol. I look through the viewfinder with my left eye! Thanks for the opportunity! I use my left eye. I use my right eye in the viewfinder. Thanks for the giveaway! I use my right eye 99% of the time. Sometimes my body position just works better with the left. I use my right eye. Thank you for the giveaway! I’m a right eye shooter. If I’m shooting sports(soccer, football) sometimes I keep both eyes open so I can follow the action–pretty trippy at first but helps .